Thomas Eastwood, 22, has been sent to prison for 10 years after throwing a corrosive liquid at a man who broke up a fight in Essex. Three men have been run over following an early morning street fight in Basildon. The family of an 80-year-old grandmother killed in a car crash in Essex have paid tribute to her. Jean Childs was driving on the A120 at Colchester Road when she was in collision with another car on 27 January. She died at the scene. Her family say she "enjoyed life to the full" and "loved spending time with her grandsons". "Mum was a very young and beautiful 80-year-old who enjoyed life to the full. "She loved spending time with her grandsons, playing cards games, needle work, knitting and anything that was creative. "She will be remembered for her beehive blonde hair style and for a being a dinner lady at Chapel Hill School for over 20 years." A puppy farm gang has been spared jail over the fraudulent sale of dogs bred in poor conditions. Warning: some details are distressing. A puppy farm gang from Essex is due to be sentenced over the fraudulent sale of dogs bred in poor conditions. The dogs were advertised online as being home-reared, but were actually kept in cages in dark sheds at an Essex travellers' site, with some dying and others suffering serious health problems. Three women and a man admitted fraud at an earlier hearing at Basildon Crown Court. Teresa Wade, 57, Roxanne Montgomery, 33, Tony Hammond, 35, and Victoria Montgomery, 55, are due to be sentenced at Basildon Crown Court on Wednesday. Staff were locked in a store room during an armed robbery. Credit: ITV News Anglia. Staff at a pizza takeaway in Essex were locked in a store room as armed robbers stole money from the till. Workers at the Dominos branch at Station Lane in Pitsea, near Basildon, heard knocking at a rear door just after midnight on Friday December 23. They opened the door and two people walked in - one holding a McDonald's bag covering what appeared to be a handgun. The two suspects ordered staff to open the till before making them get into a store room and locking them inside with a broom handle. They took the drawer from the till and left. Both men were white and between 5ft 10in and 6ft tall. One wore a black puffed jacker, black jogging bottoms and a scarf over his face. The second had dark clothing, a hooded top and a striped scarf. A man has been charged after planting a hoax bomb four times at an Essex shopping centre. Dean Platt, who's 44 and from Verbena Gardens in Laindon, was arrested yesterday in connection with four incidents that took place at the Eastgate Shopping Centre in Basildon in 1997. He was charged with placing a hoax bomb at the shopping centre on January 3, January 29, April 18 and November 11, all in that year. He has been remanded in custody to appear at Chelmsford Magistrates’ Court today. 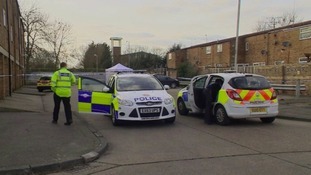 A third teenager arrested on suspicion of murder, after the body of a man was found in a burned out car in Basildon, has been bailed. 30-year-old Vilson Meshi was found dead in the back of his grey Audi in the town's Pincey Mead area on 27 February. A 15-year-old boy from Enfield was arrested yesterday. An 18-year-old girl from Pitsea and a 15-year-old boy from London who were previously arrested on suspicion of murder have both been rebailed until November 30. A teenager has been arrested on suspicion of murder, after the body of a 30-year-old man was found in a burned out car in Basildon. Vilson Meshi was found dead in the back of his grey Audi in the town's Pincey Mead area on 27 February. A 15-year-old boy from Enfield has been arrested today and is currently in custody awaiting questioning. An 18-year-old girl from Pitsea and a 15-year-old boy from London who were previously arrested on suspicion of murder have both been re-bailed until November 30. Detectives investigating the murder of a man, whose body was found in a burned out car in Basildon, have arrested a teenager on suspicion of murder. An 18-year-old girl from Pitsea was arrested yesterday (3 November). She was released on bail until 22 November. A 15-year-old boy from London, who was previously arrested on suspicion of murder, has been rebailed.